Integra: Readman may try to get in touch with us. Keep an eye open for possible messages. Integra: Also, Seras’ catboy will be staying here. Try to keep him out of trouble. There’s a bizarre story behind these pages. 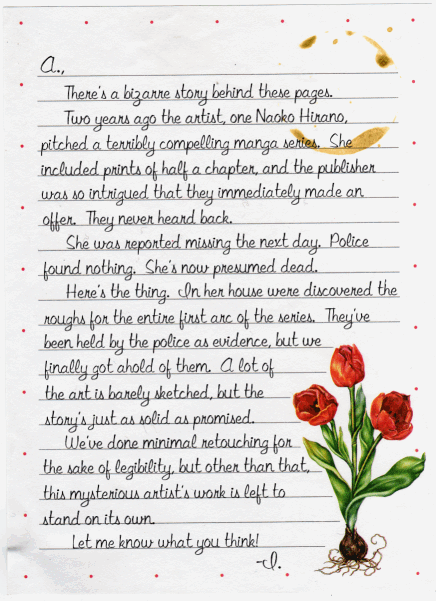 Two years ago the artist, one Naoko Hirano, pitched a terribly compelling manga series. She included pints of half a chapter, and the publisher was so intrigued that they immediately made an offer. They never heard back. She was reported missing the next day. Police found nothing. She’s now presumed dead. Here’s the thing. In her house were discovered the roughs for the entire first arc of the series. They’ve been held by the police as evidence, but we finally got ahold of them. A lot of the art is barely sketched, but the story’s just as solid as promised. We’ve done minimal retouching for the sake of legibility, but other than that, this mysterious artist’s work is left to stand on its own. Integra: It’s a nine-hour flight. I’ll have time to rest. It’s not as if I’m going into battle. I’ll be okay. One would almost think you’re worried about me. Walter: Chicago, Sir Integra? Shall I ready a plane, and pack your bag? Integra: Ah! Walter! Yes. Please do that. A most unlikely fusion. Lots of genderswap and short skirts. Originally drawn around 2004. The first half-dozen pages were redrawn circa 2009, then I realized I didn’t have the stamina to redraw the entire thing, and decided to upload the sketchy original versions as-is. This archive includes everything from the original site…plus some half-finished chapters that were never uploaded before! Alucard: I take it you’re planning to go. You shouldn’t. You’re still sick. Alucard: Your body betrays you, Master. 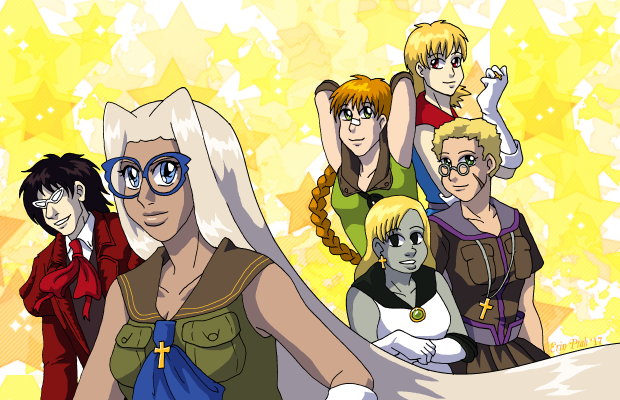 Integra: Captain Bernadette. Officer Victoria. Pack your bags for a two-day trip to Chicago. Dismissed. Seras: I’ve never been to America before. Alucard: So you’re going to see Ann. Am I invited? Integra: We’re going to make a business deal with her, not assassinate her. Integra: Alucard will appreciate this part. We’re going to need some new weapons. Seras: But the guns we have right now were designed by Walter. Of all the people we know we can trust…! Integra: True. But they are manufactured by a member of the Round Table. Sir Shelby Penwood. Him, I am not at all sure about. Alucard: We rely on those people we know we can trust…and kill anyone who gets in our way. Integra: Yes, yes, you’re very scary. Pip: So…we don’t know who we’re fighting, we don’t know where they’ll attack from, and we don’t know their abilities. Pip: Then what are we going to do? Alucard: Isn’t it obvious, Captain…? Schrödinger: Maggie Mui. Born fifteen years ago in Hong Kong. Named for her mother, who never knew the identity of that gentleman secret agent. She’s always been easy to please. Give her a cupboard to sit in and a good book, and she’s thrilled. But it would be just as easy to make her UNhappy.